Use the 1/2 tbsp butter to thoroughly coat the insides of four 4-oz. ramekins. Fil the ramekins with sugar and dump out, tapping out the excess. The insides of the ramekins should be completely coated with sugar. Over medium-high heat, bring a large saucepan halfway filled with water to a simmer. Place a medium saucepan inside the water bath, careful that the medium saucepan doesn't touch the bottom of the large saucepan (add more water if it does). Fill the medium saucepan with the chocolate chips and remaining butter and melt the mixture completely. Remove from heat and stir in vanilla and egg yolks, one at a time, reserving the egg whites. Set aside. In a medium bowl, combine egg whites, sugar, salt and cream of tartar. Using an electric hand mixer, whisk the egg white mixture until stiff peaks form, like a meringue. Gently fold the egg white mixture in two batches into the chocolate mixture. Spoon into the ramekins, filling them 3/4 full. Bake souffles about 15-20 minutes or until puffed and set. Sprinkle tops with powdered sugar if desired and serve immediately. In the category of “Holy Cow There’s No Way I Can Make That At Home,” soufflé has always been at the top of the list. We've all heard horror stories about soufflés gone wrong, including the most infamous tale – that of of the sunken soufflé. 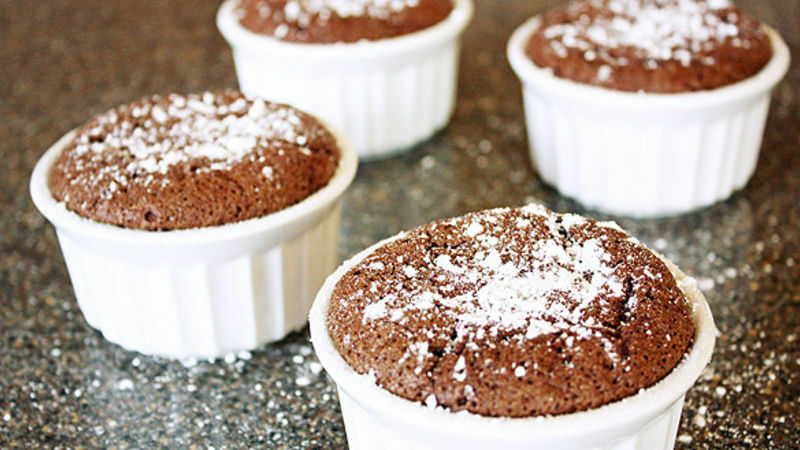 But these Mini Chocolate Souffles are not only fun, they're in fact one of the easiest – and most amazingly delicious – desserts you'll ever make. First, a few ground rules to ensure success: 1. Take your time. There’s nothing like a rushed baker to ruin a perfectly good recipe. 2. Use the best chocolate you can find and/or afford. Since this is one seriously chocolatey dessert, it’s imperative that the star of the show is, well, a showstopper. 3. Do not, we repeat, do not overstir the egg white/chocolate mixture. Slowly folding the mixture is key for getting that perfectly puffy top. 4. If you’re afraid of making one giant soufflé, make miniature, individual-sized ones. With a smaller diameter across the top, there’s less of a chance that your soufflé will sink before it has a chance to wow your guests. Also, don’t be afraid to make mistakes on this recipe once, twice or even three times. The ingredient list is small and simple enough that you won’t break the bank if you have to go back to the beginning, and the recipe isn’t very time consuming, either. So if date night is fast approaching and you’re looking at a sad soufflé, no worries! Pick yourself up and try again. And finally, even if your soufflé isn’t worthy of an award in the visual department, chances are once you take a warm, chocolatey, gooey, yummy spoonful, it won’t matter what it looked like in the first place.